If you teach early United States history and you do it (or would like to) through the novel, Blood on the River James Town 1607, then this resource is for you! 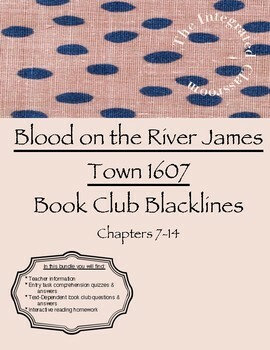 Blood on the River James Town 1607 is a novel with a Lexile level of 820. This historical fiction book teaches readers about the challenges explorers and colonists faced while traversing the wide open ocean, settling in new parts of the world, and interacting with different cultures. The author, Eliza Carbone, goes further by teaching the reader about the European class structure and how it changed in the development of the colonies. She uses great imagery, and gives teachers the opportunity to teach figurative language, character development/change, and theme. Boys, girls, and teachers always love this book. This resource was created to help teachers supplement their U.S. history and English Language Arts studies in an engaging way. 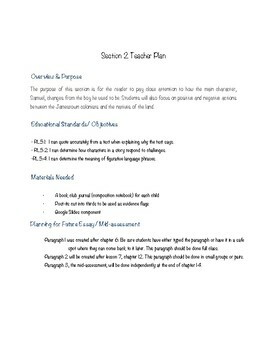 It includes: teacher information, entry task comprehension quizzes and answers, text-dependent book club questions with possible answers, and interactive homework. See other Blood on the River James Town 1607 resources to get the complete picture of learning, or purchase the set as a bundle. * Track hardships faced by the members of the expedition. * Track interactions between the Powhatan people and the European settlers. 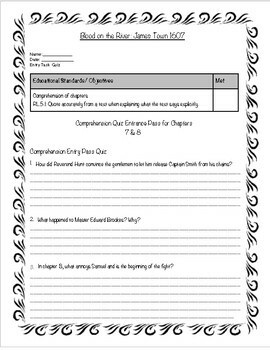 * Track character development and use the evidence toward learning how to build a response to literature written paragraph with evidence from the text.